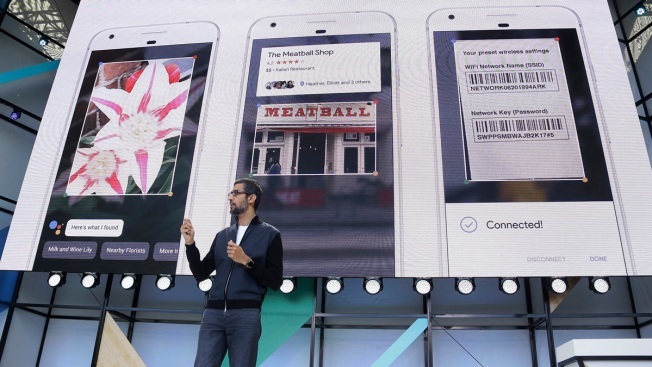 Google CEO Sundar Pichai talks about Google Lens and updates to the Google Assistant during the keynote address of the Google I/O conference, Wednesday, May 17, 2017, in Mountain View, Calif. Google provided the latest peek at the digital services and gadgets that it has assembled in the high-tech tussle to become an even more influential force in people's lives. Google provided a look at its latest digital offerings, with a heavy focus on its efforts to extend artificial intelligence features into more of its apps and services. CEO Sundar Pichai unveiled Google Lens, a set of vision-based computing capabilities that can understand what you are looking at. It will first be available as part of Google's voice-controlled digital assistant — which bears the straightforward name "Google Assistant" — and Photos app. In the real world, that means you could, for instance, point your phone camera at a restaurant and get reviews for it. Pinterest has a similar tool. Also called Lens, it lets people point their cameras at real-world items and find out where to buy them, or find similar things online. Another tool in Google Photos will prompt you to share photos you take with people you know. For instance, Photos will notice when you take a shot of a friend and nudge you to send it to her, so you don't forget. Google will also let you share whole photo libraries with others. Facebook has its own version of this feature in its Moments app. One potentially unsettling new feature in Photos will let you automatically share some or all of your photos with other people. Google claims the feature will be smart enough so that you could auto-share only specific photos — say, of your kids — to your partner or a friend. The company is also giving the crowd a look at new twists in its Android software for mobile devices, which powers more than 80 percent of the world's smartphones. The next version of Android, available to the mass market later this year, aims to gauge and control how much battery life your apps are using. A feature called Google Play Protect, meanwhile, will scan all your apps for malicious software. As part of a years-old tradition, Google will name the next Android version after a dessert or sweet-tasting snack beginning with the letter "O." (The current version of Android is the N version, Nougat.) It often takes years for a new version of the software to make it to older phones, and never arrives at all for some. Rival Apple plans to provide unveil changes to the operating system for its popular iPhone next month. Many of Google's products are also vying against similar offerings from other tech conglomerates like Amazon and Microsoft. Google is also planning a slimmed down version of Android for low-end phones, primarily used in the developing world. Called Android Go, this software will automatically enable data-saving features and will steer users toward apps designed specifically for inexpensive hardware. Phones with less than one gigabyte of memory will automatically get Android Go. The overview came Wednesday during Google's annual conference for thousands of computer programmers. As part of April Fools' Day, Google has released a special Ms. Pac-Man game you can play using Google Maps. The browser game works on computers and mobile devices. It will be available until April 4. Wednesday's keynote took place at an outdoor theater near the company's Mountain View, California, headquarters.